How to serve a volleyball is an important skill. The serve is the only skill in volleyball where the player has complete control. 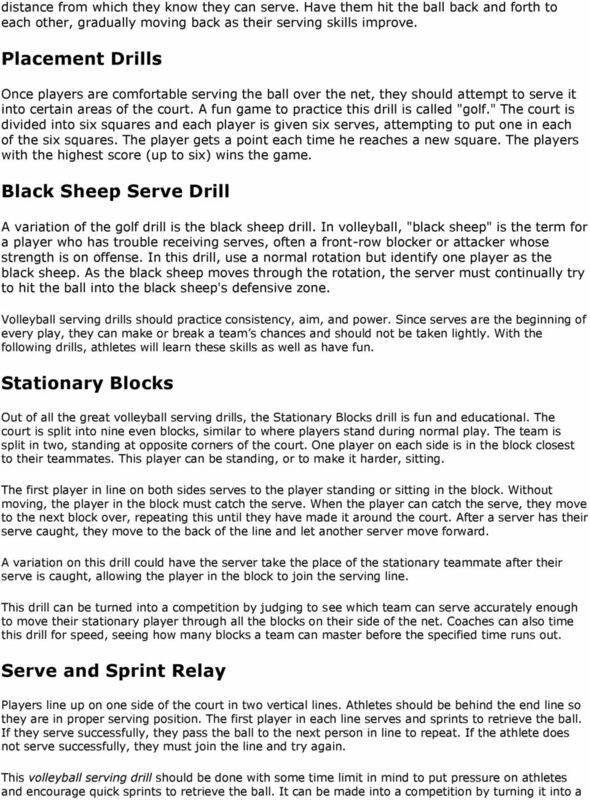 Download "How to serve a volleyball is an important skill. The serve is the only skill in volleyball where the player has complete control." 1 Serving How to serve a volleyball is an important skill. The serve is the only skill in volleyball where the player has complete control. 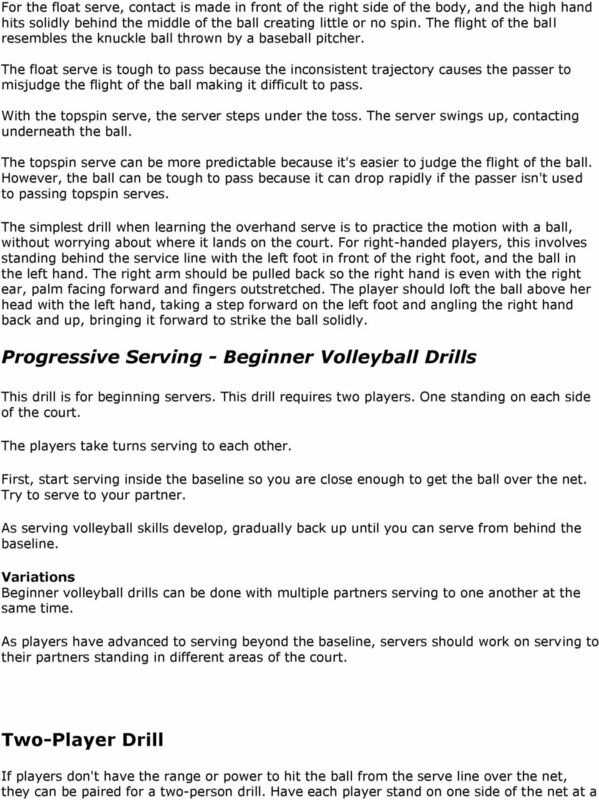 Three main types of volleyball serves There are three main types of serves in volleyball. The underhand serve is most common for beginners. The overhand topspin and the overhand float serve are the most common serves for competitive volleyball. More advanced types of serves include jump serves and float serves to different areas of the court depending on what the coach has signaled. Underhand Serve The underhand serve is the easiest one to teach because there are few variables. 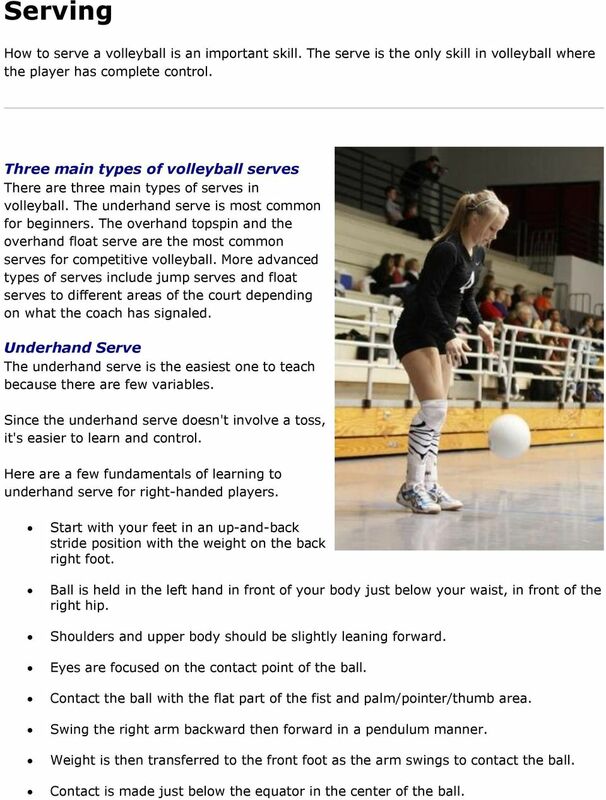 Since the underhand serve doesn't involve a toss, it's easier to learn and control. Here are a few fundamentals of learning to underhand serve for right-handed players. Start with your feet in an up-and-back stride position with the weight on the back right foot. Ball is held in the left hand in front of your body just below your waist, in front of the right hip. Shoulders and upper body should be slightly leaning forward. Eyes are focused on the contact point of the ball. Contact the ball with the flat part of the fist and palm/pointer/thumb area. Swing the right arm backward then forward in a pendulum manner. Weight is then transferred to the front foot as the arm swings to contact the ball. Contact is made just below the equator in the center of the ball. 2 The left hand drops just prior to contact. After contact, continue to follow through the ball toward the target. Overhand Serve When learning how to serve a volleyball, you will need to learn techniques for the overhand serve. The overhand (overhead) serve is the most popular serve in high school and college. The two main overhand serves are the topspin and float. The overhand serve is tougher to pass than the underhand serve because it comes faster and drops faster. 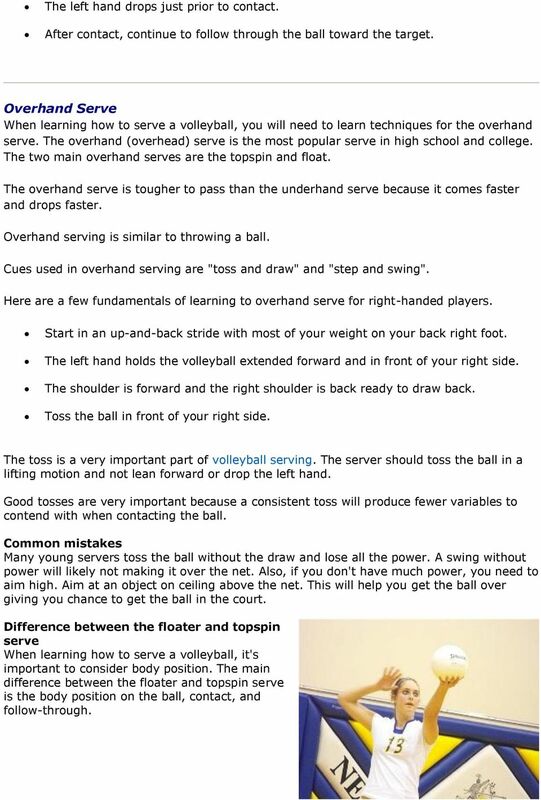 Overhand serving is similar to throwing a ball. Cues used in overhand serving are "toss and draw" and "step and swing". Here are a few fundamentals of learning to overhand serve for right-handed players. Start in an up-and-back stride with most of your weight on your back right foot. The left hand holds the volleyball extended forward and in front of your right side. The shoulder is forward and the right shoulder is back ready to draw back. Toss the ball in front of your right side. The toss is a very important part of volleyball serving. The server should toss the ball in a lifting motion and not lean forward or drop the left hand. Good tosses are very important because a consistent toss will produce fewer variables to contend with when contacting the ball. Common mistakes Many young servers toss the ball without the draw and lose all the power. A swing without power will likely not making it over the net. Also, if you don't have much power, you need to aim high. Aim at an object on ceiling above the net. This will help you get the ball over giving you chance to get the ball in the court. Difference between the floater and topspin serve When learning how to serve a volleyball, it's important to consider body position. The main difference between the floater and topspin serve is the body position on the ball, contact, and follow-through. 5 relay, with the first team to cycle through everyone successfully winning. The losing team can be punished with volleyball conditioning drills. Target Practice Like the opposite of dodgeball, the Target Practice drill intends for athletes to hit their teammates with the volleyball. Three players on each side of the court line up as servers. All other players sit on the court wherever they please, ensuring that there is an equal number of players on each side. Servers must attempt to hit their teammates, who are on the opposite side of the court. Once a teammate is hit, they jump up, retrieve the ball that hit them, and join their teammates across the court in the serving line. The first team to get all players up and in the serving line wins. Athletes should be sure to cover their heads and pay close attention during this and other volleyball serving drills, as the ball can hurt if athletes are not prepared. Notes: If the practice takes place outdoors adult players should use the Match instead of the Fun Speeder for the exercises. Coaching Points. Footwork and Movement Skills. INITIAL STANCE Forms the starting point for most attacking and defending skills. Lights Baseball. Fun We work during practice and scouting so we can play during games. A Let Serve is allowed. It is when the serve touches the net and goes over the net. Golf Swing. Golf Swing Mechanics. Address Position. Posture To position the upper body correctly you must have the proper stance as described above. The golf swing is just that, a swing. In nearly all sports that involve swinging an implement, a bat, a hockey stick or racquet, the object to be struck is moving. In golf, the ball is always stationary. Teaching Badminton Based on Student Skill Levels By Jianyu Wang and Jeff Moffit Helping children and adolescents develop physically active lifestyles is the core of quality physical education programs. 9 New Soccer Drills Your Team Will Love!